SKU: DSG-12_Boss_C. Category: Slug Guns. 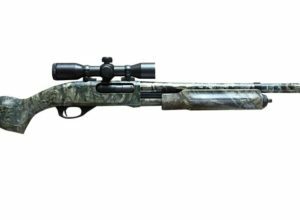 The Super Mag 3 1/2″ Express “BOSS-C” designation refers to the fact that TarHunt installs a “non-removable” (except by a gunsmith) custom fit new TarHunt straight rifled turkey barrel to a Remington 870 Super Mag receiver. This straight rifled turkey barrel has a, solid threaded in, one-to-one fit, for the best possible accuracy. The straight rifled 3 1/2″ chambered turkey gun comes standard in Mossy Oak Camo. The turkey barrel measure 23 inches in length and it includes the standard screw in REM-CHOKE system. Scope bases are Included, rings and scope are not. 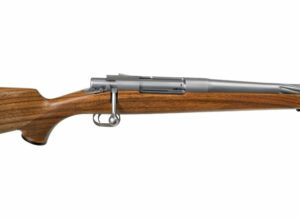 To convert the Remington SM 870 to a DSG, TarHunt will first measure the barrel hole in the front end of the receiver. Custom fit a block of steel into that receiver. We then fit, thread and screw in the new TarHunt straight rifled turkey barrel into that steel block. We then drill and tap the top of the receiver and install a custom made set of scope bases (using #8 screws) that are designed for the top of an Super Mag 870 receiver. Placing the scope, solidly mounted in this position, aligns the scope with the bore of the turkey barrel. This assures the best possible accuracy for head shots on turkeys. The Super Mag 31/2″ Express, “BOSS-C” will have a 3 1/2 inch chamber. 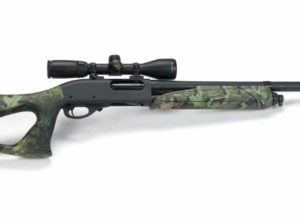 A Mossy Oak Obsession, ShurShot ambidextrous thumb hole pistol grip stock, with molded over grip panels recoil pad and quick-detach sling studs. SPECIAL ATTENTION: Residents of NJ are required to provide a Firearm ID Card prior to shipment of any firearms. Ownership of this weapon must be transferred thru a current FFL holder. For more information, please visit our Purchasing, Cancellations, and Returns policy page. “ENVY” model Stainless Steel RSG-20ga. or RSG-12ga.